Having given birth to 10 children, I can say with confidence that having a kidney stone is the closest a man can come to childbirth! Passing kidney stones naturally is possible and it can be painless. Passing my first kidney stone while we lived in Switzerland was quite a surprise. After all, I had never had any problems with them before. My father was very much into natural solutions that work. The recipe found here (like the one used to pass gallstones) is one that he had typed on a piece of paper with no reference as to where it came from. But, both work! 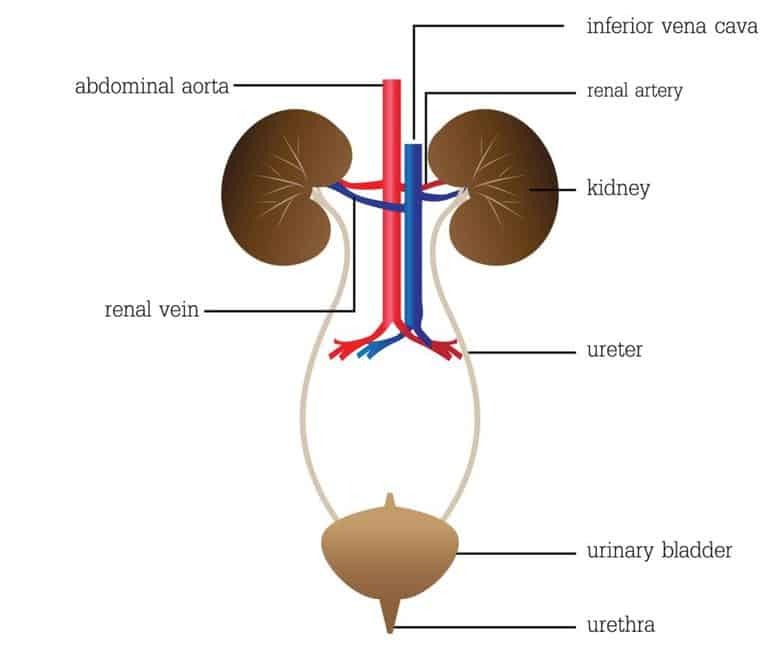 The urinary tract is composed of the kidneys, ureters and bladder. The kidneys (your body’s filter system) make urine from water and your body’s waste. The urine then travels down the tubes called ureters into the bladder, where it is stored. Urine leaves your body through the urethra. As kidney stones move through the urinary tract, pain is experienced and may change from being in the low back to another location. It may also become more intense and then ease off or visa versa. Dehydration – not drinking enough water. When the urine is concentrated, minerals are allowed to crystallize and stick together forming larger crystals or stones. Struvite stones- formed in response to an infection – most commonly a chronic urinary tract infection. Some bacteria make urine less acidic and more alkaline (basic). Magnesium ammonium phosphate (struvite) stones form in alkaline urine. Drink plenty of fluids. The normal recommendation is 8 – 10 glasses per day. A good way to be sure is the color of your urine – it should be clear to light yellow. Dark yellow urine means you are not drinking enough! Avoid foods high in oxalate. There is no need to completely avoid them but decrease them. These foods include dark green vegetables (like spinach), chocolate, nuts, cola, black tea. Drink lemonade made from real lemons. They contain citrate which may help prevent kidney stones. The recipe found here in Passing Kidney Stones Naturally has worked for me and for others. 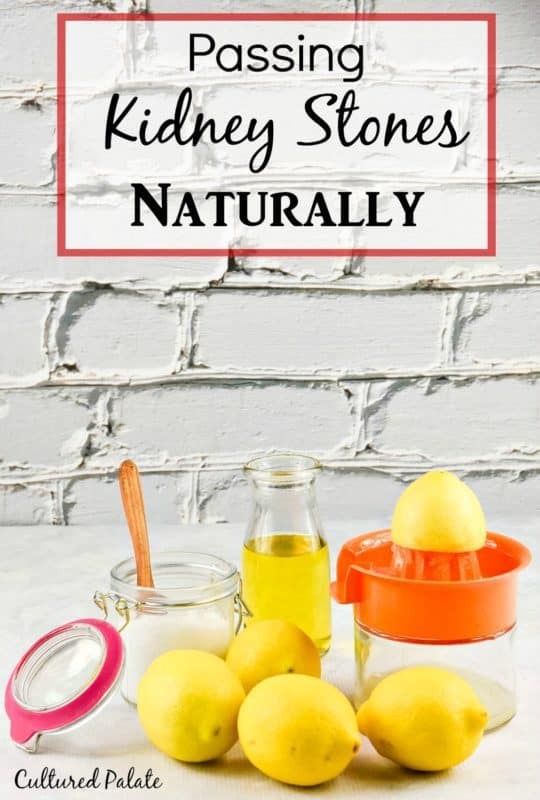 The best home remedy to encourage the stone to pass is to drink lots of fluids, especially plain water and citrus juices such as orange or grapefruit. The extra fluid causes you urinate more, which helps the stone move and keeps it from growing. You can add freshly squeezed lemons to your water as often as you like. Lemons contain citrate, which is a chemical that prevents calcium stones from forming. Citrate can also break up small stones, allowing them to pass more easily. A friend of my sister also used this effectively when other treatments had failed. He was nauseated, vomiting and just plain sick. After visits to his doctor, they did not want to do surgery and opted to wait. He tried this cleanse and it worked! If stones become lodged in the urinary tract, they can obstruct the flow of urine creating a urinary tract infection which will result in fever, chills and acute pain. 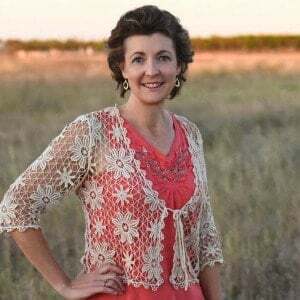 I am sharing what has worked for me and do not claim to give medical advice. I know from experience that kidney stones are painful but this cleanse has worked for me! That being said, you are responsible for your health so, if you are concerned and especially if you have fever or chills, please see a doctor. First thing each morning, squeeze the juice of one whole lemon into a pint of warm water and drink it right down. DO NOT ADD SUGAR! This is important because the drink goes straight to the kidneys and starts its purifying and healing process. At 8 pm repeat 1 Tbsp Epsom salt with a full glass of water. At 10 pm – mix and drink quickly, 4 oz. olive oil and 4 oz. lemon juice. After this, I go to bed. This will enable you to pass the kidney stones and I also, normally have varying sizes of bright green gallstones visible in the toilet. The Epsom salt acts as a laxative to quickly remove them from the intestinal tract. This part of the cleanse (day 6) is identical to the gallbladder cleanse found in How to Get Rid of Gallstones Naturally and is used for passing kidney stone also. Here is a link to the products that I use for this natural solution. 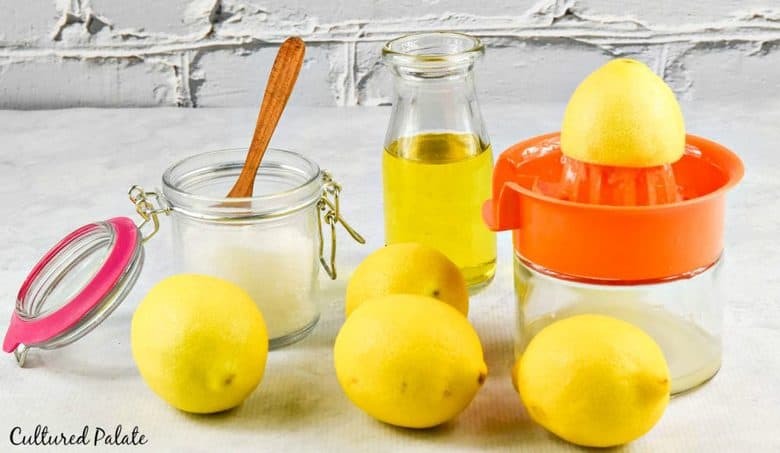 Lemon juice – Fresh lemon juice is needed for the first 6 days to drink in the morning but then bottled may be used for the evening dose which is mixed with olive oil. Nice to read this. My mum is about 93 and has been diagnosed with kidney stones and doctors advised against surgery because of her age. Seondly, she has ulcer so I don’t know what to do about this now since they said lemon can trigger ulcers. Yakubu, if your mother decides to do this, I hope it will help. I really cannot give medical advice but will be praying that you choose the right thing for her. Have you heard of anyone trying this when the kidney stone is stuck in the ureter? Becky, I have not but the lemon juice will help to break up the stones. I just have not had any experience with one in the ureter – maybe another reader? I am so bless to be here, your blogs and emails content have top values for both physical and spiritual. Thank you so much! My ultrasound and CT scan showed that I have gallstones, kidney stones and prostate enlargement. I will start with pass gallstones today or tomorrow asa I got apple juice. About My enlarged prostate BPH that caused narrowing my urethra/urinal tube, bladder cannot be empty out. There are 2 surgery procedure options: Urolift and drill to open up the urethra tube. I wouldn’t select any. Do you or someone know any natural solution? I asked my General Surgion Specialist to hold on the removing my gallbladder. I was searching for a natural solution for over 3 months. Loi, I am sorry but I do not. I use an Integrative Medicine Doctor – he is a medical doctor but trained to fight causes not just alleviate symptoms. Maybe you could find one in your area? Hello, I have a large kidney stone in my kidney and another one smaller stuck in my ureter near the bladder. I’m having a go at your recommendation. I’m on day 2 now. I’m trying to understand how Epson salt can help with kidney stones. Also seems like by having 2 Tbsp in 2 hours you have exceeded the daily recommendation in the package. Is that safe. The Epson salt I bought here in the UK days only one teaspoon per day. What do you think about that? Regards, Jorge. Jorge, I have not had a problem and my package does not have an amount to exceed. Since you are only using it for this, I would not be worried. That being said, you need to do what is right for you and if you are concerned…it should be your decision. This recipe was one from my father and I have had used it with success as has several friends. I hope it helps you because, I firmly believe that this is the closest you will come to childbirth! Shina, you can either go by your symptoms (no longer having any pain) or go back to your doctor. There is a chance you passed it and did not realize it but it could still be there. Kidney stones normally hurt as they are moving.